Magnetic speedos can be fixed! New glass, new rim, new paint , new faces and looking and working like new. Call! BrItish bikes till about 1963 use mechanical Smith’s chronometric instruments. Lovely clocks with a chrome plated screwed bezel and a typical white needle that follows a jerky path along the dial. Many chronometrics have suffered a violent and premature end at the hands of mechanics with penetrating oil, Birmingham screwdrivers and even soldering lamps who tried to fix the needles behaviour. The successor was the magnetic with a rolled on chrome bezel. A simpler concept, but also quite vulnerable. 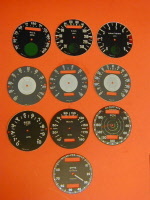 Around 1975 french Veglia clocks are introduced. Most speedos use a square/square inner cable. Tachos/rev counters are driven by a spade/flat end. Long nut on clock end is for magnetic speedos (often a groove has been made in the knurled nut). Short nut on clock end is for chronometrics. Veglia speedos use their own cables with a different thread.